The long anticipated opening of MonTissu is just over the horizon, it will be open this Saturday officially, but if you have been chomping at the bit to see the new location for Lamb, Tres Blah, Mon Tissu and Turnip then Lula is where you want to go. Turnip Sorbet has been working on the build for the past few months, and it has been well worth the wait. The style of stores are just charming I wish there were more of them to explore, the landscaping is some of the best I have ever seen, this is not just a commercial sim, this is a destination. Earlier today a few dozen fans got the chance to have morning tea with the owners of Mon Tissu and special guests Lamb and Turnip. Lamb has already opened her store with the new rlelease of her hair Wild Nothing, which I am wearing in the post. Tres Blah also released a new skin, but I am wearing an older one from the blur event of a few months back. I am also wearing some of the tops that are due for release, the So Boho top I have been coveting for weeks now, the style is superb, old vintage handcrafts made into something so wearable and chic, the Joli beaded tunic is a divine cleavage enhancement without being too out there. Both tops are created by the two owners of Mon Tissu and truly show their talents.There is a lengthener skirt base to the So Boho top, but I loved the finish it had without as well. I was watching an old tv show earlier, and the main girl was wearing some great gaucho pants. I have a few pairs in SL but was thinking that some of my favourite pants might be convertible, and sure enough with mod and copy as an option I was able to shorten and edit the prims, and voila, my Fri.day trousers are now gauchos…I even flared out the pants layer, so they weren’t a tight fit, yay for mod clothing. Whmsy and I were fortunate to be invited to the preview of Osakki’s new mainstore opening the other night. Not a huge collection but a great start, and such a great array of mix and matchables. The leggings I have on were part of that release, and if you are a leggings/tights fan, then you best get on over there. The leggings and most of the clothing is so 80’s reminiscent for me, so I had to go there, with my leg warmers and armwarmers I could totally audition for my leading role dance number, after I get the man and of course have fabulous hair all the way through. 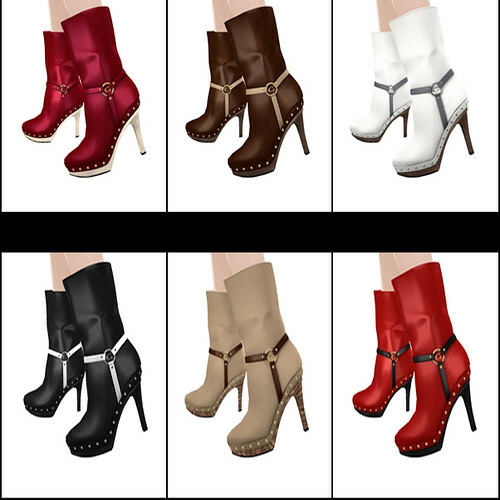 In both pics the shoes are new, the first set being the latest slouch boots from Gos, so many options, with metals changing and the leather option of the boot, or the straps and wood/sole base, its all interchangable. These worked out really well with my pants, and with the tops of them being not so tight, they are great for tucked in pants for winter weeks to come. 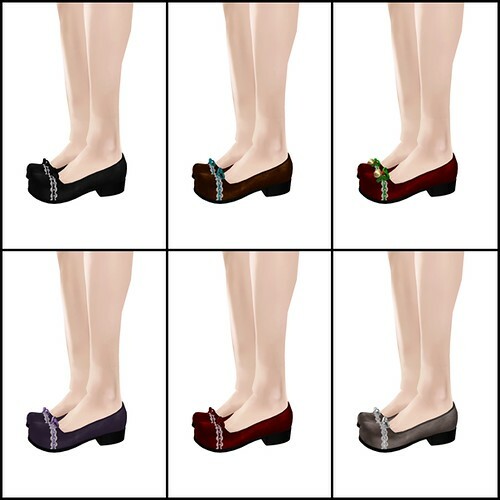 The flats are adorable and from SLink, these are June shoes and are available at the Albero event that starts today…so many things start today, it is funny how often stuff starts same time as other stuff, I wish the lindens would make some sort of google calender and we would all put in dates and lock them in, would be so much easier on everyone. It is one of those collective conscience things I guess, it freaks me out how often we talk about something amongst a small group and then others end up doing same…Whimsy thinks we are bugged lol.